This is the last day of the year, so it’s probably a good time to look back and see what interested people on this blog. This has been a banner year for low cost ARM devices and boards starting with the Raspberry Pi, then MK802 and the new mini PCs / HDMI TV dongles / PCs-on-a-stick (whatever you want to call them) that came after, always cheaper and faster. Those low cost devices have in turn made people really interested in ARM Linux, and lots of development on those little devices and boards started. 74 USD AllWinner A10 Android 4.0 Mini PC (May 2012) – MK802 started the whole “low cost mini PCs” craze, and drove the most traffic to this blog this year. People got excited about the price, form factor, and the possibility to run both Android and other Linux based operating systems. MK802 II Mini PC Now Costs as Much as Raspberry Pi Model B. Let’s Compare Them! (December 2012) – This post features the 2 stars of 2012: the Raspberry Pi and MK802 II HDMI TV donglwe (MK802 with 1GB RAM). As both device can now be bought for $35, and allow you to do very similar things, it’s was time for a head-to-head comparison. I’ve just written about it last week, and it got Slashdotted. WM8850-MID Android 4.0 Tablet Unboxing and Review (June 2012) – At the time, this Eken W70 clone featuring Wondermedia WM8850 Cortex A9 processor was a real bargain for $72 (including shipping). The firmware has a few issues however, and that’s what drove people to this post: looking for solutions. 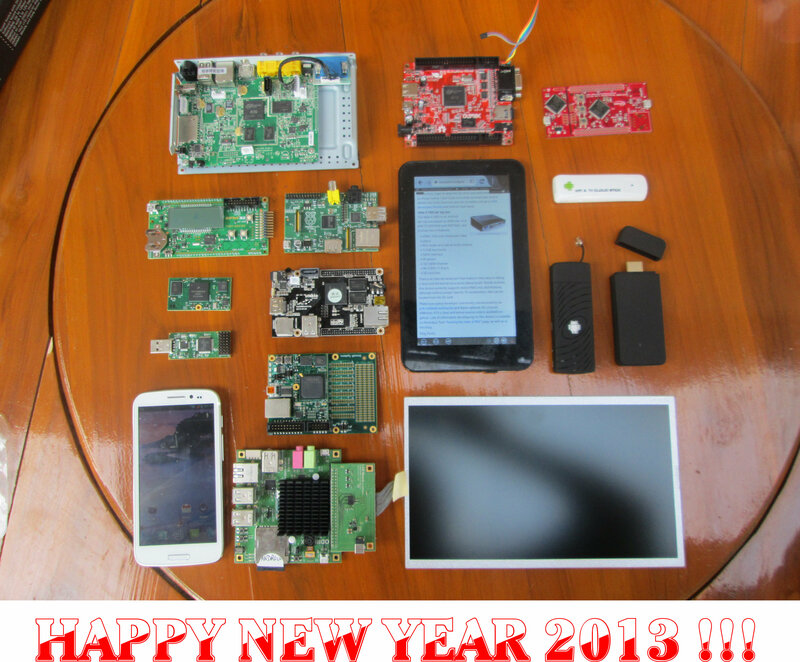 AllWinner A10/A1X Processor Resources, Development Board and SDK (December 2011) – This post was written just about one year ago, but traffic was steady all year, as people want to find out how to hack their AllWinner A10 tablets, media players and mini PCs. Mele A1000: AllWinner A10 (Cortex A8) Based Hackable Android STB (March 2012) – The Mele A1000 was my first Android device, and it got popular thanks to its relatively low cost, available ports (3x USB, SATA, VGA, HDMI…), and serial port which made it ideal for development of U-boot and the kernel. I still think it’s a good platform, but since then low cost development boards such as the Cubieboard has made it a little less attractive, and interest has somewhat faded in the last few months. Valueplus Tizzbird Stick N1: Android 4.0 HDMI/USB Media Player Dongle (March 2012) – The Tizzbird Stick N1 was one the first mini PCs, and was showcased at CeBit 2012 several months before MK802. Unfortunately, it took many more months to finalize the design, and the product never took off, as other cheaper Telechips TCC892x based mini PCs appeared on the market. The only reason it got traffic is because I mentioned it in the $74 MK802 post at the top of this list. Mele A1000 Android 2.3 STB Unboxing and Review (April 2012) – In March, I was still waiting for the Raspberry Pi launch, but I noticed Barry Kauler (Puppy Linux) bought the Mele A1000 to keep him busy while he was also waiting for his Pi, and seeing the development around AllWinner A10, I decided to buy one as well. Apparently, I was not the only one interested as many people came here to read my review of this nice hackable media player. Mele A2000 Android 2.3 Media Player Powered by AllWinner A10 (April 2012) – The Mele A2000 is the little sister of the Mele A1000, which the same hardware, just a difference casing. Linaro Android Puts Stock Android To Shame on TI Pandaboard (OMAP4430) (June 2012) – Linaro showcased a demo showing an optimized version of Android could deliver twice the performance of stock Android on a particular benchmark running in Pandaboard. Bero commented on my post with details, and the post quickly became viral as developers wanted to give it a try. It turned out the improvement is actually more like 15 to 20%, but this is enough to double the framerate of this benchmark due to Vsync synchronization. It may also work in real games. Raspberry Pi Emulator in Ubuntu with Qemu (October 2011) – In 2011 and early 2012, the Raspberry Pi foundation promised much in terms of schedule, but initially failed to deliver, and many people get desperate enough to check the instructions to emulate an ARMv6 device and run Debian in QEMU to get started with development, before the Raspberry Pi hardware is available.